Really pretty and reasonable price!! I use this on the deck for many things - mah Jong, cocktails and other games. I have bought these fitted tablecloths many times before and really enjoy them. They are colorful and do not wrinkle as they are fitted. High quality with a beautiful color. It also fit perfectly. it fits my octagon table...happy me. Thanks to customers that told me it did...unsure ...gave it a try...fits ..looks great. Love, love, love it! Fits perfectly!!! Use it on our family dining table. Protects the wood surface and is pretty to look at! Fits like a dream!!! I actually got this for an oval table and wasn't sure how well it would fit but it does and fits very well! Now wishing I would have purchased two of them. Great table cover, easy to clean fits great. Great to put over your Oak table to protect the wood and I put a nice cloth table cloth over it. Works great!! great protection for my wood table that doesnt slip and slide around with everyday use. 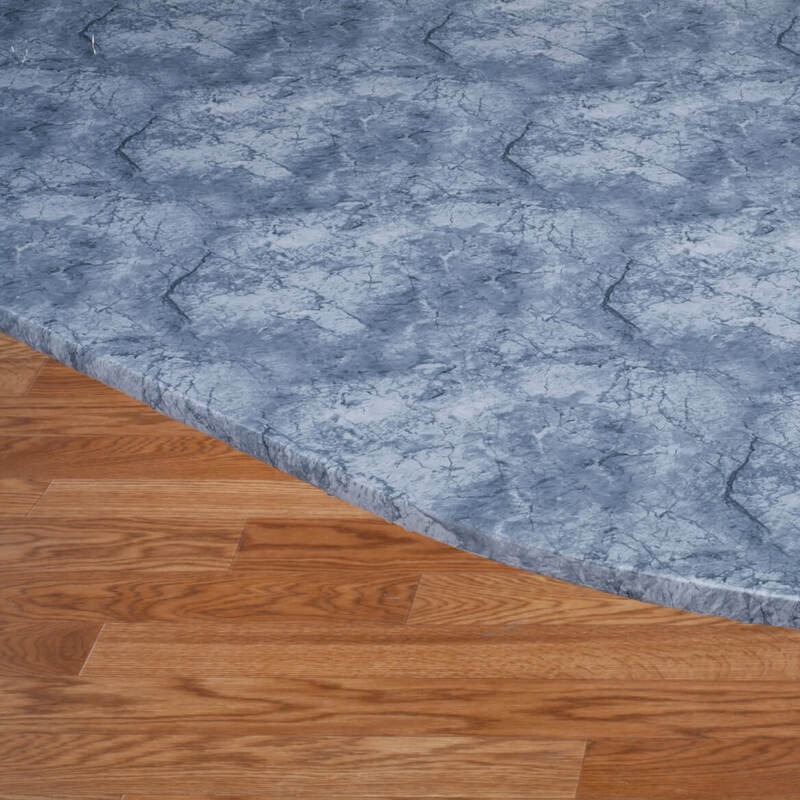 I ordered the 'gray marble' cover to hide a super-damaged wood tabletop to be refinished in Spring. This is the table we eat meals at and is in a very visible area. I had read reviews stating these covers arrive very wrinkled in the package and people are actually using a cloth over-and-ironing them--which does'nt work well. Take hope! There IS a FAR EASIER WAY! Remove it from the package, (put it on your table to make sure you've got the correct size) Then take it off the table, take it to your dryer, and place inside with a very damp handtowel and dry on the low-heat setting for around 20 mins. Remove PROMPTLY while it's very soft and pliable-this is important!--and put it on your table! There may still be some slight wrinkling on it but don't worry--these will smooth out over the next day or two. Looks BEAUTIFUL~just like the magazine and online! The perfect solution to problems we had with a table pad/cloth combination; it stays put, cleans very easily, and protects the wood underneath. My second one. Love them. Use it on my patio table. It fits perfect. We love it. I use these on a round table on my entry room. Looks very good. For the people who are not satisfied. This is an inexpensive vinyl covering. It is not meant to be elegant. It is for a casual setting. The wrinkles can be smoothed out with a hair dyer on low setting and stretched. (liked the dryer reviewer, haven't tried that yet) With use, the wrinkles will eventually smooth out. No, you cannot put rough or sharp things on it and slide them around and expect no tears. Yes, it is shiny. It's plastic. It's a great covering for a tabletop that is less than attractive. I use it on a table to play cards. Easy cleanup with spills, and the cards slide nicely versus felt. If you want padding I recommend a rubber type backing. Wipes clean and is great protection for my glass top tables when the grandchildren visit. 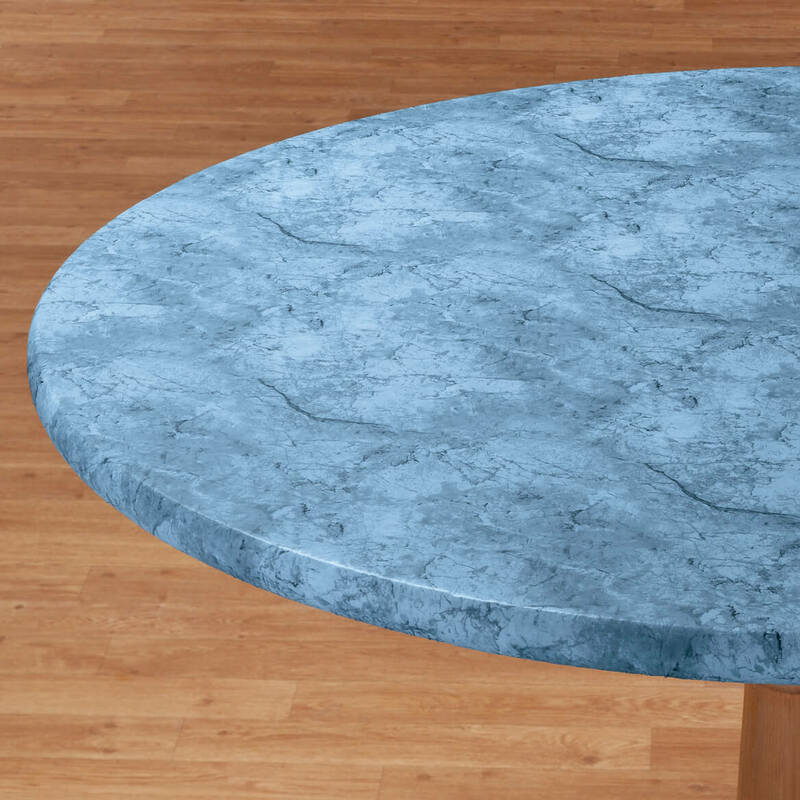 marbled elasticized table cover is GREAT and Pretty. Our tablecloth always moves and gets longer on one side than the other, so the elastic really helps to keep cloth in place! Our kitty always darts under the table when in trouble and a long cloth protects her from the squirt bottle, now she can't go unpunished!! We placed this table cloth on a glass table it looks just like marble. i like these vinyl tablecloths because the color doesn't fade & as long i take care of it from cutting on the table, (i use a cutting board or plate) it lasts for years. it is high quality & thick, and i like the elastic to wear around my table. This product works well with my 4 year old grand son who can be a bit messy at times. Use for outdoor table. Holds up good to weather. Good quality fast shipping. We live on a lake and it's always windy on our deck. This table cloth stays put no matter how hard the wind is blowing!! Takes just seconds to put on. Love it! Can't believe they don't sell these in stores. I can't live without them! The blue marble is more elegant than other patterns. Loved the product so much I bought another one! Great product. Just what we wanted. Good value and finally a tablecover that actually fits a 48" round table. Other covers I have bought were of poor quality and never fitted propertly==this one does! Purchased this cover for our patio table outside. It looks nice and does protect our glass surface of our patio table. Plus it is easy to wipe off the dirt and keep clean. Super product! Have ordered many! Use it on the umbrella table and my kitchen table. I'm thrilled they now come in square and oblong for card tables and banquet tables. Super for entertaining!! This is a very convenient product! I mistakenly ordered the smaller round size when I should have ordered the next size up in round. Since I would have to pay for shipping, I didn't return; but, it is a nice tablecloth to throw on your glass table if you're going to play cards/games. Very nice tablecloth. Just the right color for my porch! I gave this to my sister who has a glass top bistro type table on which they eat their meals. It fit perfectly. She says that it is so nice not to have to clean the glass after each meal. She just wipes the vinyl table cover clean! Love the color. Protects my patio table and adds beauty at the same time. I have ordered this product for years. Made the mistake of trying other catalog products that seemed like the same, but the color and finish is better with the Miles Kimball product. 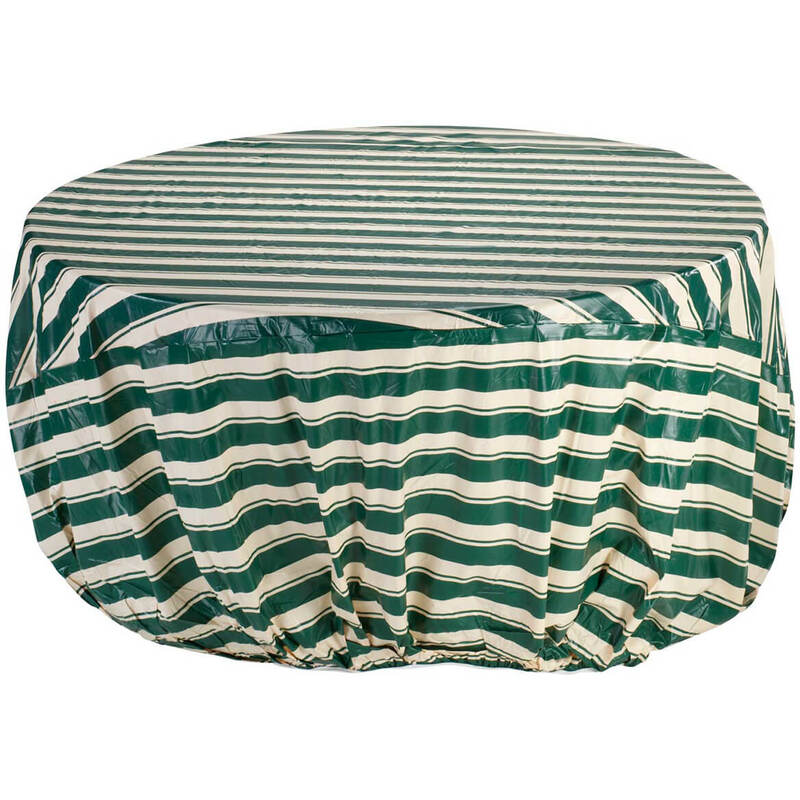 It's a great patio table cover and it fits perfectly and is waterproof too. I have been using these table covers for years. I love them for protecting my tabletop. They are good quality and even though with small kids eventually they do get tears in them I think they are well worth the money. Easy wipe clean and I save my wooden tabletop. They fit my 48inch round table perfectly. This blue marble is very nice. It covers the table perfectly, easy to keep clean, and attractive. I put this over my 54" glass-top table as soon as I received it. The fit is perfect and the flannel backing gives the protection I needed! I purchased two designs...antique fruit and green marble... and love them both. They complement my kitchen and my friends rave about them! I like to change the look of my card table every so often, so the second one is just the thing I needed! Now everyone in my card club does the same thing!! use everyday on table in my kitchen. Look the look. Cleaning is a breeze. 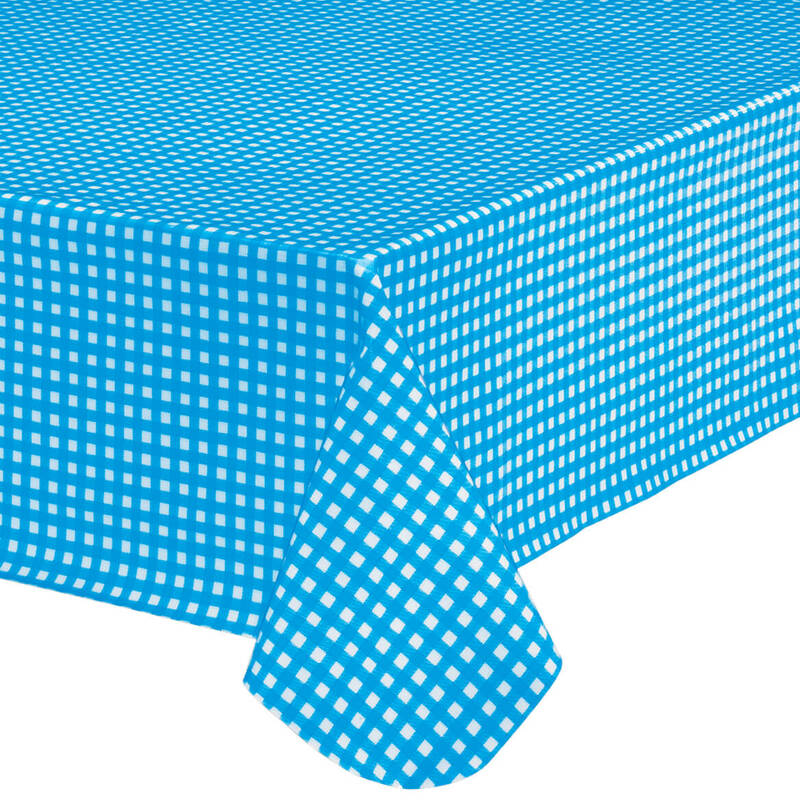 Like a fitted mattress sheet, this fitted tablecloth is a breeze to put on, and stays in place! No slipping or sliding off the table, which means no spillage or food dropping on the floor. Wipes clean with a damp sponge or paper towel. Has a soft fleece backing to protect table underneath. I've been buying this for years, and will continue to do so. Looks great and save the table top. Love these tablecloths. The elastic feature is great. They save wear and tear on the table top and look wonderful. I was having a problem protecting the fire pit in our yard from dirt and leafs and found the cover in your catalog, it works like a charm. After enjoying the fire pit around the patio area and after it has cooled down the cover protects the glass chips from all the dust and leafs and even the rain whenever it comes...CA! We matched the table covers to the same pattern and love the effect even when the pit is not in use. They don't last forever out in the open, but the price is right to buy another when they go-Thanks! Use outside and wind doesn't blow it like regular covers. Using this on an old patio table. Fit perfectly. We'll see how long it lasts, but at this price I can get a new one every year. Use outside on screened porch.......just wipe with cloth.......always neat and fresh looking! This is a .hard to find item and it is just what I needed. It is used on my patio and is very durable. The tablecloth goes well with my upholstered chairs, and I really like the tight fit. Because it's relatively difficult to put the tablecloth on by yourself (2 friends helped me), I don't recommend removing the item and putting in the washer/dryer. i do buy this product over and over again.Great for outside. Fits great around my round table! Provides a smooth attractive table cover for entertaining and playing cars. hours of work before it looked like I expected. Now it is nice looking and functional. A great product for the table so people don't pull it off. Easily cleans up. Grandchildren can accidentally pull it off. may have to think twice about buying again. The tablecloth is nice but it is not as taut as I expected it to be, and does not lay as smooth as the last one I had (from a different retailer). I like it a lot. I bought 1 before and it was too big for my table but I used it anyway. This 1 is a perfect fit. 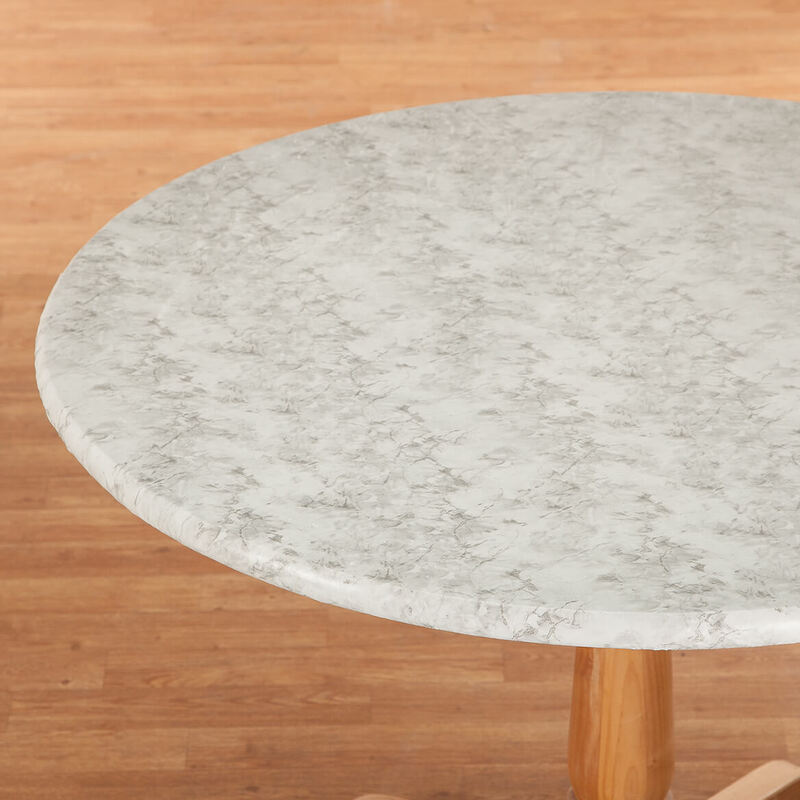 Loved the marble look and the way it doesn't slips off the table like regular table cloths doe when people sit down. The fit is good. The pattern is attractive. The color doesn't rub off like other fitted table covers I have bought before. I will buy more of these. Table cover very wrinkled when received - I"m still working on trying to get some of them out. I plan on using it more when we play games at the table than using it for meals so the wrinkles are not something that I can't live with. I was concerned that the shape of my table didn't fit either oblong or oval but this particular tablecloth fits quite nicely. Possibly the creases could be ironed out from the back but I'm not going to try it because looks aren't my main conern. My table has an acrylic finish and shows scratches so this will be a good protection while playing bridge and family board games. Very pleased with this table over. It arrived wrinkled but a minute in a warm dryer fixed that problem. Looks good. I ordered another for my mahjong table. Nice, easy and looks great on the deck! The elastic on the tablecloth is very secure. The pattern is very nice (marble blue). The tablecloth is cut larger than my table on the width portion, but is still secure. This fits my outdoor table even though it is an octagon shape. It wipes up easily. It would be nice if it was of a thicker material. You cannot put this into washer. I got a lot of compliments when I had it on my table for a few months. I changed my color and decided to wash this to put it away. I used the gentle cycle and cold water and it fell apart in the washer. I guess I should have only wiped it down. I love the blue marble pattern and the color blue they picked out for it. It came very wrinkled in the package and it is taking a long time for the wrinkles to come out. I feel the tablecloth itself is a little thinner then ones I have purchased in the past. I am not sorry I ordered it and have it on my table right now. I like because it was easy to put on and I like because it has the elastic all around and easy to clean,however,the material is a bit delicate feels like it will tear easily. Needs replacing every 6 months, when used daily. Good product for the price. I have a round metal table in a screened porch that I painted last year and all the paint flaked off over the winter. Just needed something to look good and give it a clean makeover. This table cloth fit perfect and made for a great quick cover up to an ugly table. Don't know how long it will last but for the price was a great solution. I was expecting something a little more durable and sturdy to hold up to 'everyday' usage. The other problem that I had with this item is that even though it did fit my 41" round table ..it did not have much of an edge to snap under the table rim to keep it in place securely. Otherwise it worked to the time that I needed it. It works even though it does really fit well. Write-up is better than product! I bought (2) table covers which I liked very much...at first. They fit my table well; not too tight. However, after several weeks of being on the table - which was in a covered outdoor space in cool temps - the elastic, for no apparent reason unless it was substandard elastic, stretched to the point of hanging down below the table although there was little to no tension involved. I am very disappointed as this happened with both covers. The Gray doesn't look Gray at all and comes very very wrinkled and hard to get out. I was excited to see this elasticized table covering because we have a round kitchen table where we eat most of our meals with a toddler, and she has started to pull the edges of our traditional tablecloths. However, when this table cover arrived, only a small 12" x 12" square in the middle was smooth, and the rest of the surface was extremely rough. Not wrinkled so much as it feels like the plastic was overheated and bubbled up or something. I am going to attempt to iron it out (from the felt side, or with a cloth over the plastic portion) and see if that helps, but if it doesn't, the covering will be okay for craft projects, but not for everyday use. Also, when ordering I ordered the small size since our table is only 41" in diameter, but would order the next size up next time, as this one fits perfectly, but my daughter can reach under and pull up the edges. Next time, I'll get one that has a little extra fabric wrapped around the bottom to prevent that. The tablecloth rips and tears when items are placed on it. We sat a book on it and it caused a tear. When we tried to superglue it down, the tablecloth lost all its pattern and turned white. Now we have a big white spot on the tablecloth. I don't think I would purchase another one. Limited use in a church. But I've had 5 of the 10 I purchased snag easily. But can't afford to replace all 10 so must hope the next ones will wear better. 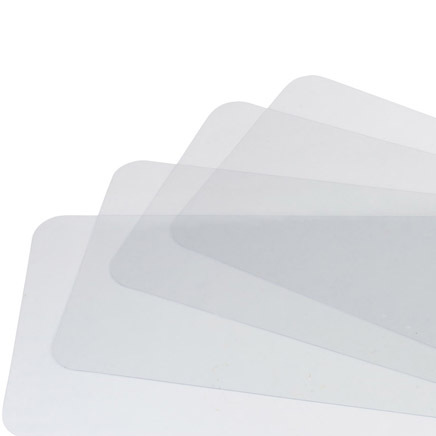 Very thin vinyl material. Wrinkles in item do not come out. Why bother giving measurements if they are not accurate.? I have purchased elasticized table covers for my patio for many years, and been very happy with the results. However my last purchase included one from the line, "marbled." My fingers went through the fabric as I tried to pull it on, and there was about a 12 inch section where the elastic was not sewn to the fabric. I returned these, quality poor. I have purchased this type of tablecloth before from this company and was THEN pleased, but NOT NOW. The quality was sub-standard and felt cheap in hand and on table. I bought these and white ones and returned them all. I needed them and was very disappointed. The ones I purchased a few years back were much better. Did not fit my table. Description and label on product states fits tables up to 42 X 68 inches. My table is 42 X 60 inches. This does not fit. Will give to charity; would be too expensive to return it. I called customer service and told them that it would not fit and would they poay for return postage as I fel that it whould fit my 42 " table as others have. It was whatI was looking for.and the right size. so we could play cards on a glass top round table!! Needed a waterproof padding for my round tabletop. Color matches my décor and it will protect my dining room table surface when I have card parties. I have ordered your tablecloths in the past and they look really nice. 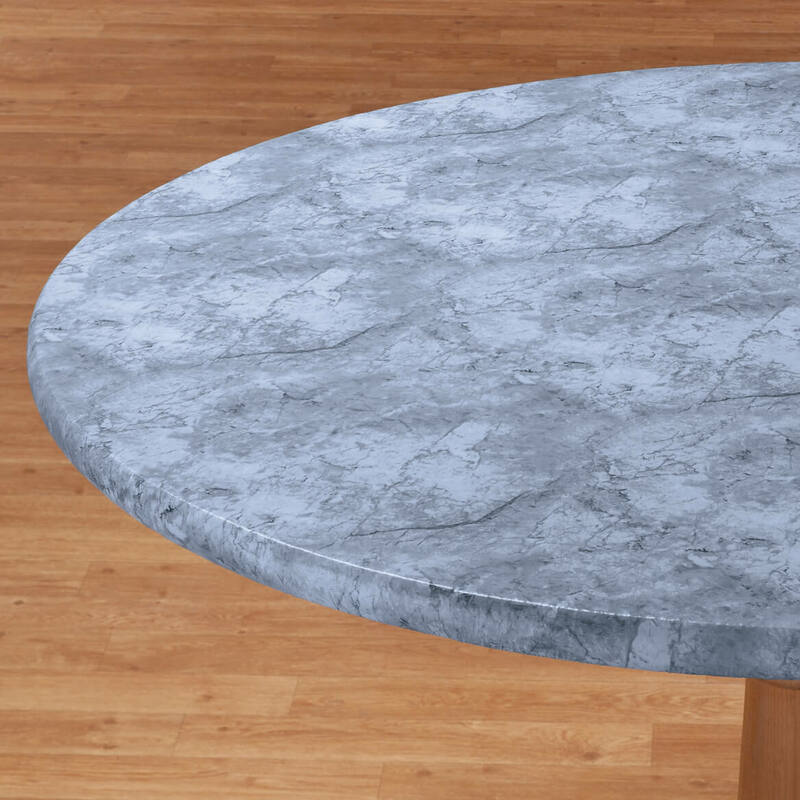 One time a friend actually thought I had a granite table - but it was the grey granite tablecloth. They were surprised !! To enhance the look of my weathered patio table. I have a small breakfast table I would like to protect and this seems to fill the bill. I bought one before and it is great! To match with my chairs covers. The company that I purchased this before no longer sells this item. Have used item in the past. Love the fit and very easy clean up. Protects table, always looks nice. Cover table nicer than table throw cover. I have a large round patio table that I want covered. 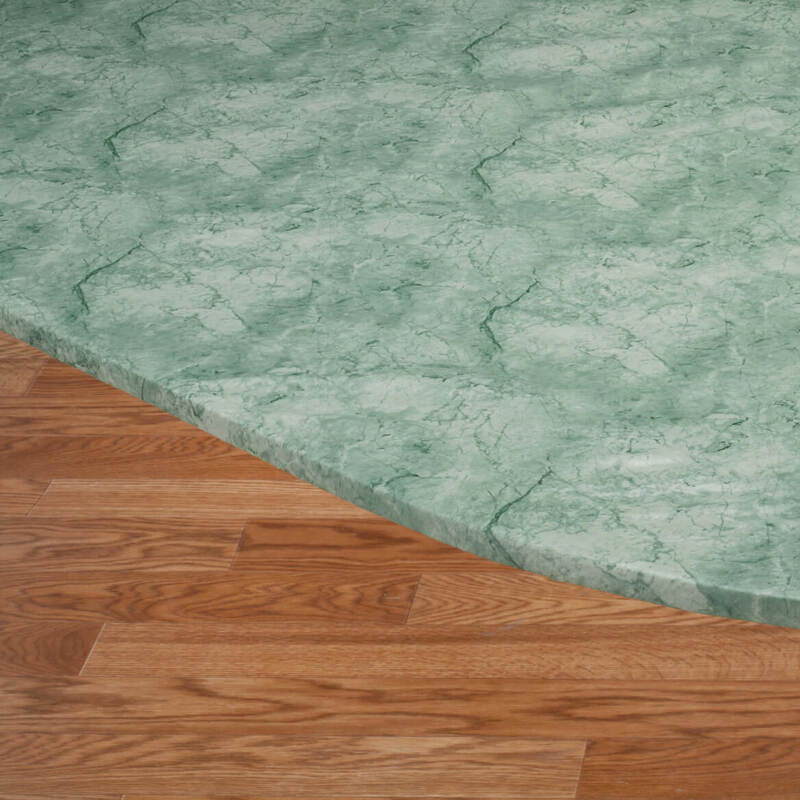 For a change of pace I chose this green marble cover for my glass table. I like to change colors at times so I ordered two different ones. They are durable and very pleasant to look at. No one knows there's a glass table underneath.. I need this for my outdoor table. I have a round wooden table and these work great and help keep my wooden table nice and clean. Thought I would try this color and pattern. Fun! Purchased this previously and loved it! I like the marble look and color. Currently have one and looking for another color to change things up. Durable and easy to care for. 2nd one bought. Fits very well doesn't stretch out. Same as above, the color, the fit. my table is 48" will the 45" - 56" fit it? BEST ANSWER: Thank you for your question. 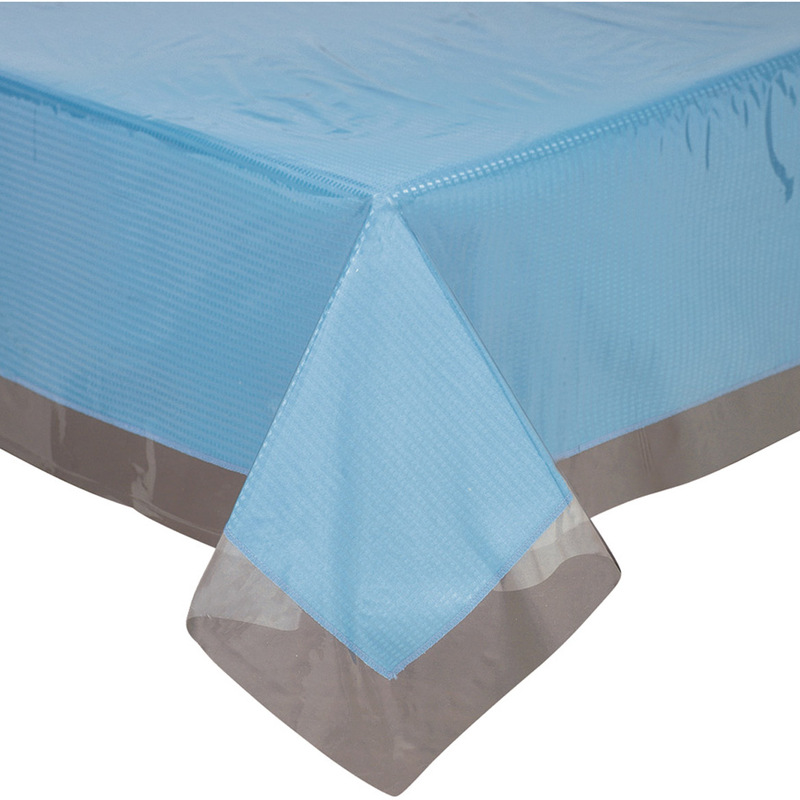 It is an elasticized table cover and will fit that table. We hope this information will be of help to you. My table is octagon shape...would the round 45-56 work? BEST ANSWER: Thank you for your question. It is stated for round but may work depending on size, thickness and shape of table. If an item does not work out for your needs, you may return it at your cost. We hope this information will be of help to you. I might. Probably depends on how sharp the octagon corners are. I would probably get as large a size as possible with in reason. I don't know that much an the combination size. Hope this helps a little for you. Yes, my table is octagon shaped, also. It works fine. Janet B.
the lip on both sides of round table make it measure 45 1/2, does your measurement allow for it to fit of the edge/lip and under? BEST ANSWER: Thank you for your question. 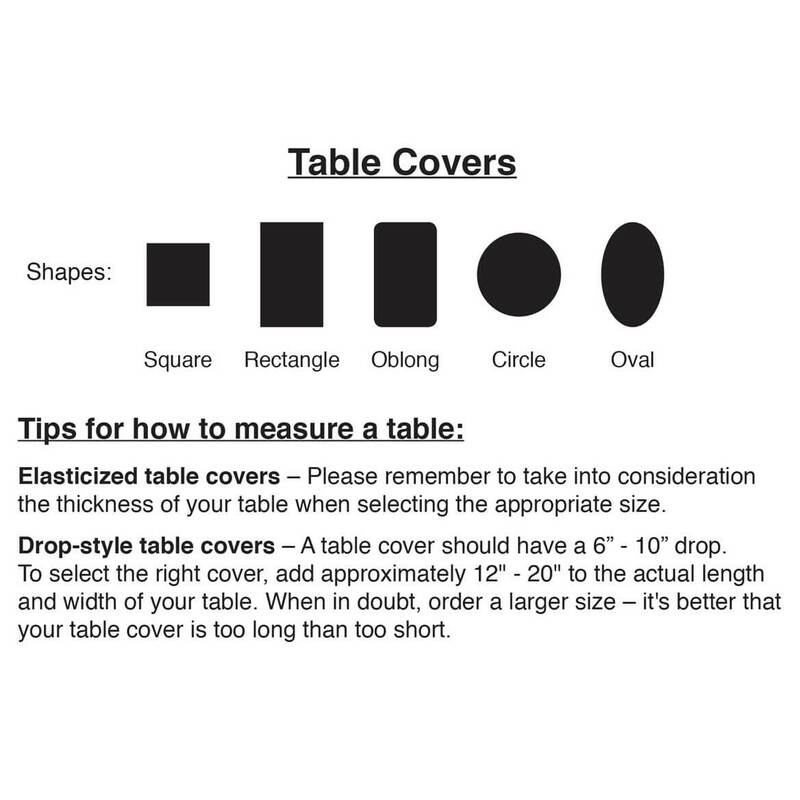 You need to add the measurement of the lip of your table into your table's measurements to determine the correct size table cover for your table. We hope this information will be of help to you. I just ordered this in gray but was wondering if you ever have it in beige/brown in addition to the other colors? That would be my preference and it seems like other folks might like that neutra color as well. Thanks! BEST ANSWER: Thank you for your question. We can pass along your comments about the colors. 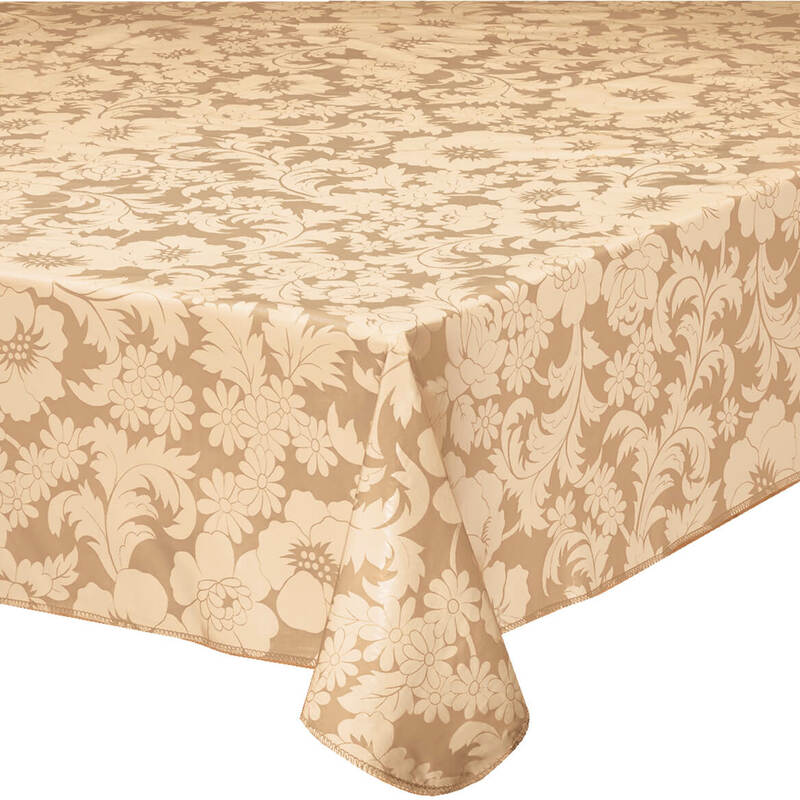 We suggest you search for other table covers that come in the colors you would like. 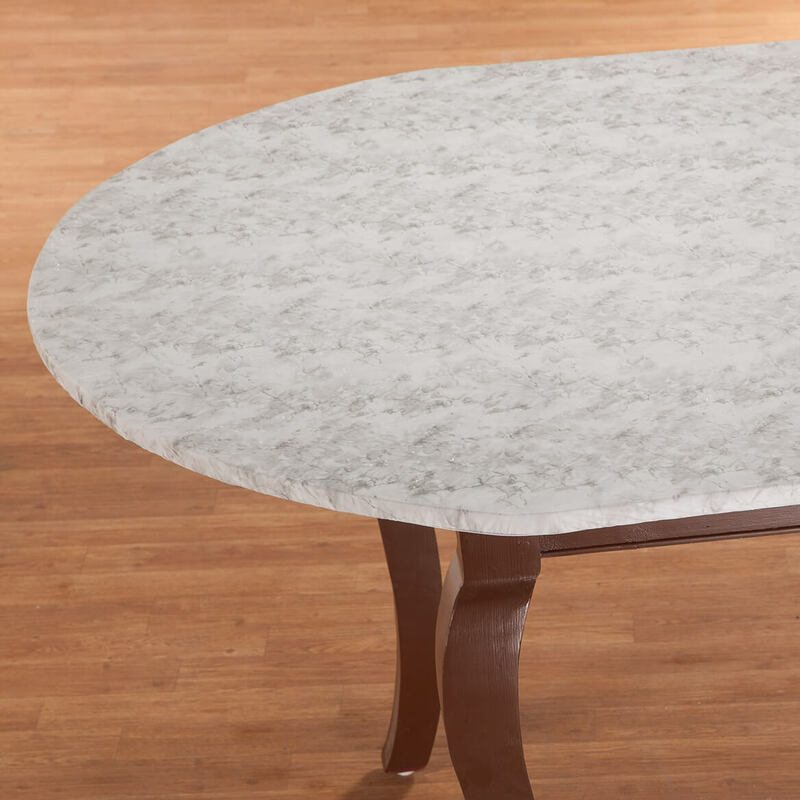 The Polished Granite Vinyl Fitted Table Cover comes in tan and gray. We hope this information will be of help to you. table is hexagon 45" x 471/2" since it stretches should I go with 40" - 44" or the 45" - 56"? BEST ANSWER: Thank you for your question. This table cover is intended for a round table so it would not fit well on a hexagonal table. We hope this information will be of help to you. Is this table cover vinyl? BEST ANSWER: yes it is. I purchased one awhile back just like this but I'm not sure it was from here and it was quite heavy. Thinking it was the same one I bought this one and was not quite as heavy as my first but is still what I am looking for. I don't use any other kind of tablecloth, especially with grandkids around. Yes,I have several and love them.Put it in your dryer a couple minutes before you put it on the table. No wrinkles !!!!!!! Yes, with light felt backing. How do I get the wrinkles out of of elasticized table cover from packaging? BEST ANSWER: Thank you for your question. We apologize that the table cover arrived wrinkled. The wrinkles should dissipate over time however this can be expedited by exposing the table cover to some hot steam and then laying the table cover flat. You can also try placing it in a dryer on low heat, along with a few damp towels for a few minutes at a time. Using an iron on low heat and a damp towel on top of the table cover to iron out creases may work for you as well. We hope this information is helpful and we apologize for any inconvenience this has caused you. Someone said to iron the tablecloth with a low to medium setting on the backside. I've found that the wrinkles come out naturally by themselves in time and the tablecloth looks great. Love it. if table cloth is the right size just put it on & the wrinkles will be gone. my table is on the smaller side of the 45 to 56 round. What happens with extra fabric? BEST ANSWER: As long as you have at least 45 inches the tables cloth will fit fine as it is fitted with elastic that secures it to the bottom side of the table. It automatically goes under table via elastic. That is why it is perfect. Have been using them on woodeen kitchen table for years. My table is 42 inches, and the elastic curls the extra width of the cover underneath. It looks very nice. Will this fix a patio table? BEST ANSWER: It fits mine and is very easy to clean when we have all the pollen in Florida especially in the spring. I would not be without it during that time. great cover, looks like the real thing. easy to keep clean. The grey looks blue on my computer - how grey is it? BEST ANSWER: Thank you for your question. 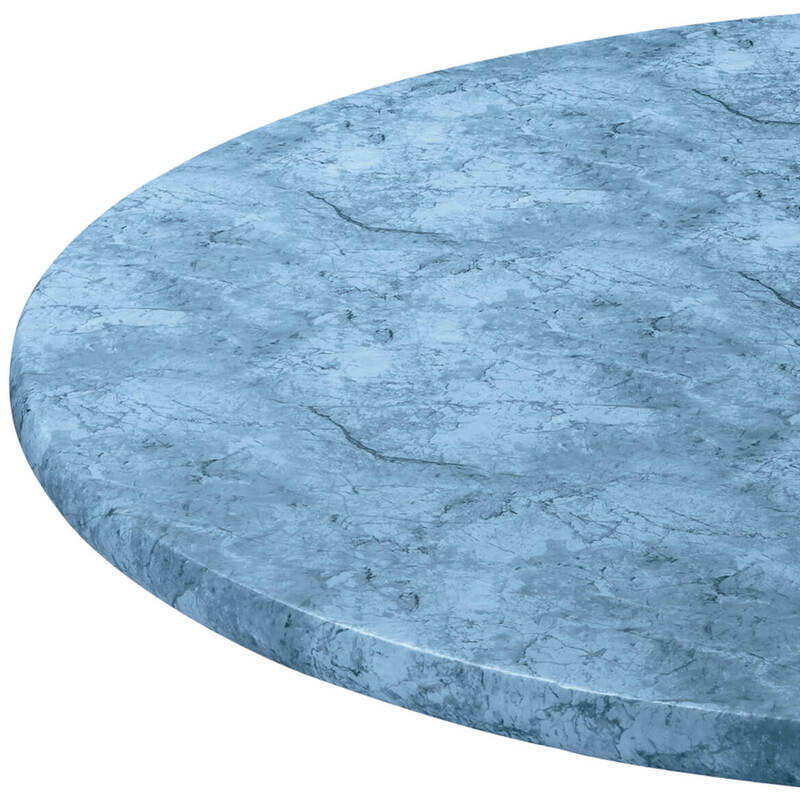 The gray table cover has a slight light blue coloring to it. We hope this information will be of help to you. do these covers work on hexogonal shaped tables? BEST ANSWER: Thank you for your question. The covers are made for round tables and may not fit a hexagon table as it has small corners. We hope this information will be of help to you. I would love one of these fitted vinyl table cloths but I need one extension on my table making the measurements 78 x 42 oval. Can I get one that size? BEST ANSWER: I also have a round table but once I put the extension in and leave it in all the time my table is now an oval shape. For years the 45"- 56" round worked perfectly , and still does but I can not find any of the holiday decorated table cloths with elastic anymore in this size. I did find the oval or oblong size and have ordered that and pray it will also fit since my table really is oval now. If it just wont fit or looks ridiculous they do accept returns if they are with in a short time. Thank you for your question. 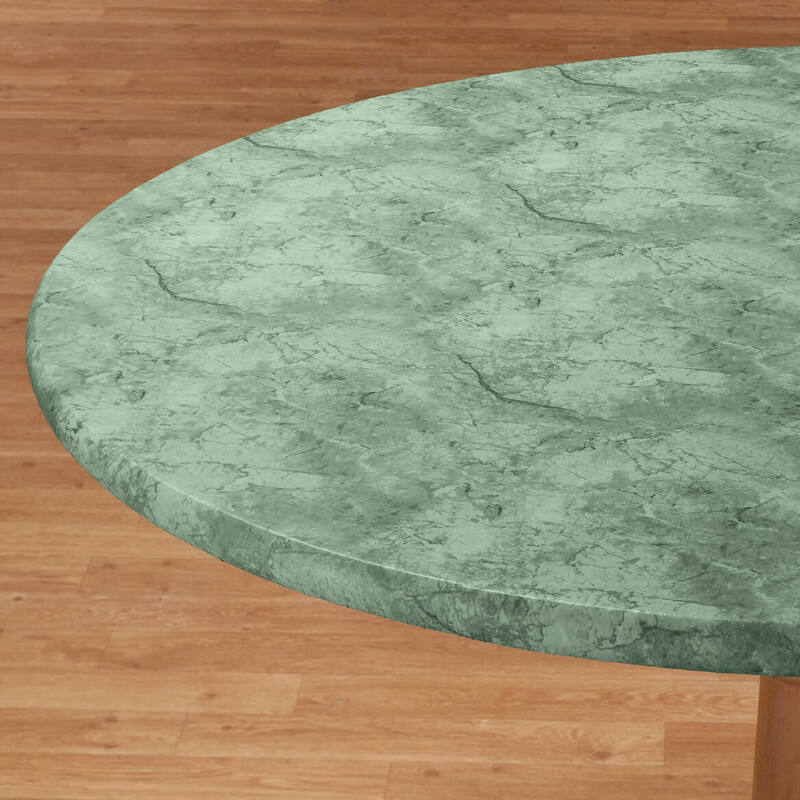 The Marbled Elasticized Table Cover comes in three sizes 42" by 68" oval, 40"-44" round and 45"-56" round. We do not carry other sizes. We hope this information will be of help to you. My table is 48 round, will this tablecloth fit snug? BEST ANSWER: Thank you for your question. The 45"-56" round will fit snug on a 48" table. We hope this information will be of help to you. BEST ANSWER: Thank you for your question. No this item does not come in any different sizes. We hope this information will be of help to you. Will the 42 x 68 fitted oval elastisized tablecover fit my 42 x 58 table? BEST ANSWER: Thank you for your question. Yes, that size will fit. We hope this information will be of help to you. my table is hexagon measures 54" longest distance across which one will fit ? BEST ANSWER: Thank you for your question. You can order 45" - 56" dia. Round. Although if your corners are squared this table cover may not work. We hope this information will be of help to you. MY ROUND TABLE IS HEIGHT 30'' DIAMETER 48'' ? I have a 42 1/2 " X 60 5/8" Oval Table, will this cover be to bulky/large for my table? Any other colors? BEST ANSWER: Thank you for your question. Any extra length will bundle up under the table as it is elasticized. The cover only come in the colors shown. We hope this information will be of help to you.